Meigs sophomore Weston Baer (3) goes for a layup attempt between two Athens defenders during the second half of Friday night’s TVC Ohio boys basketball contest in Rocksprings, Ohio. ROCKSPRINGS, Ohio — Good start. Less than desirable finish. 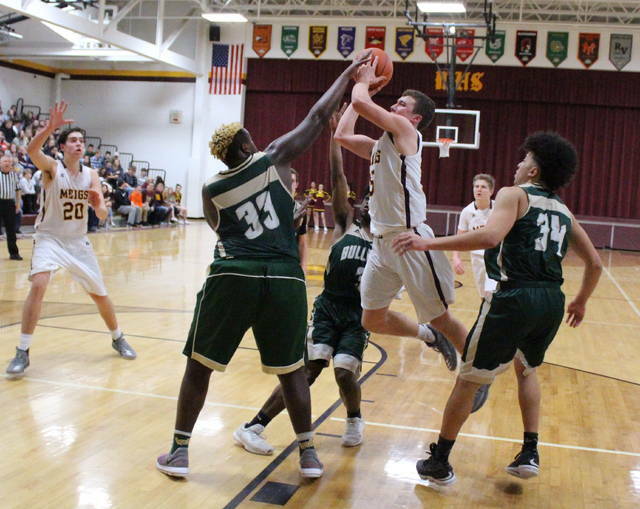 The Meigs boys basketball team scored the first 11 points of regulation in just under three minutes of play, then managed only 10 points over the rest of the first half on Friday night during a 66-41 setback to visiting Athens in a Tri-Valley Conference Ohio Division contest at Larry R. Morrison Gymnasium. The host Marauders (2-10, 1-5 TVC Ohio) — making their first home appearance since Dec. 22, 2017 — certainly seemed happy to be back in the friendly confines after storming out to an 11-0 cushion just before the five-minute mark of the opening canto. The Bulldogs (4-9, 4-3), however, received eight points from Elijah Williams as part of 13-6 run to close out the first period, allowing the Maroon and Gold to secure a 17-13 edge through eight minutes of play. Logan Maxfield hit consecutive trifectas 90 seconds into the second frame to give AHS a permanent lead at 19-17, and those long-range bombs also sparked a 15-0 charge that allowed the Green and Gold to turn a two-possession deficit into a commanding double-digit lead at 28-17. Weston Baer ended a near-five-minute-long scoreless drought with a basket to make it 28-19, but the guests closed out the final 2:30 with a small 5-2 run that resulted in a 33-21 advantage entering the break. 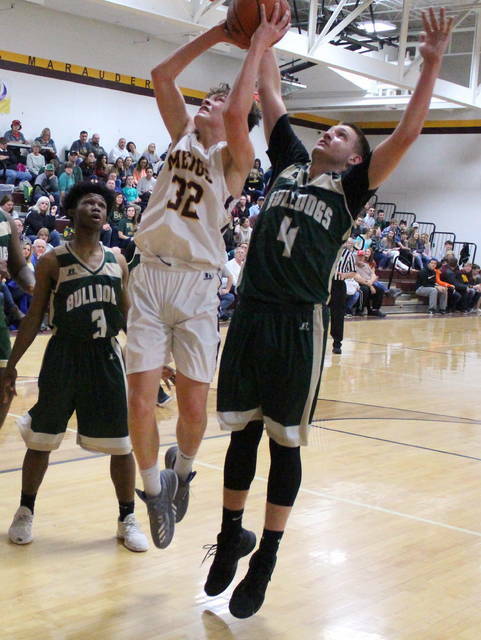 The Marauders were never closer the rest of the way as Athens started the third period with an 11-2 surge for a 44-23 lead with 3:49 left, but Baer snapped a four-minute scoreless cycle with a basket at the 3:13 mark for a 19-point deficit. The Bulldogs countered with nine straight points to end the quarter with a 53-25 cushion. Athens also led by 28 points at 55-27 (6:37) and again at 57-29 with 6:14 left in regulation, but Meigs ended the game with a 12-9 run to complete the final 25-point outcome. 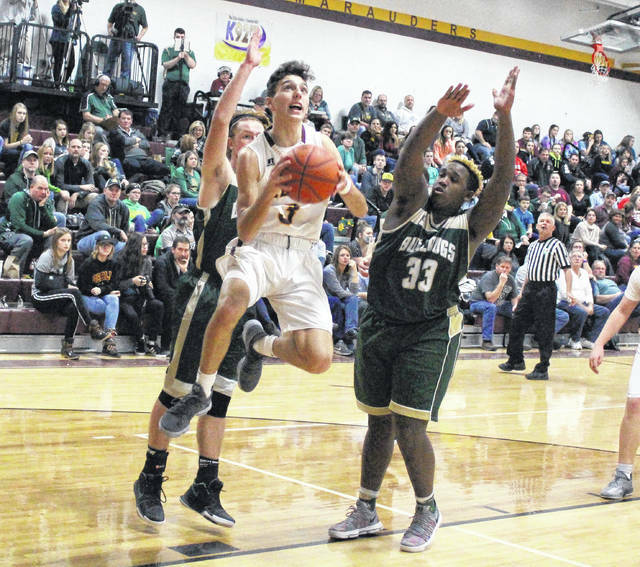 AHS — which ended Meigs two-game winning streak — also claimed a season sweep of the Marauders after posting a 54-45 win at McAfee Gymnasium back on Dec. 12, 2017. The Maroon and Gold connected on 16-of-48 shot attempts for 33 percent, including a 2-of-16 effort from behind the arc for 13 percent. The hosts — who committed 20 turnovers — were also 7-of-9 at the free throw line for 78 percent. Baer led MHS with a game-high 21 points, followed by Zach Bartrum with 12 points and Bobby Musser with four markers. Nick Lilly and Austin Mahr completed the scoring with two points apiece. Bartrum and Jacob Roush each hauled in a team-best five rebounds, with Bartrum also dishing out four assists. Musser also recorded three of the Marauders’ five blocks in the setback. The Bulldogs made 27 total field goals — including five trifectas — and also went 7-of-15 at the charity stripe for 47 percent. Maxfield led Athens with 17 points and Williams added 14 markers, followed by Isaiah Butcher and Justin Hynes with nine points apiece. Eli Chubb and Henry Gerig were next with five points each, while Dalton Cozart and Micah Saltzman respectively added four and two points. Nathan Whitehead completed the winning tally with a single point. 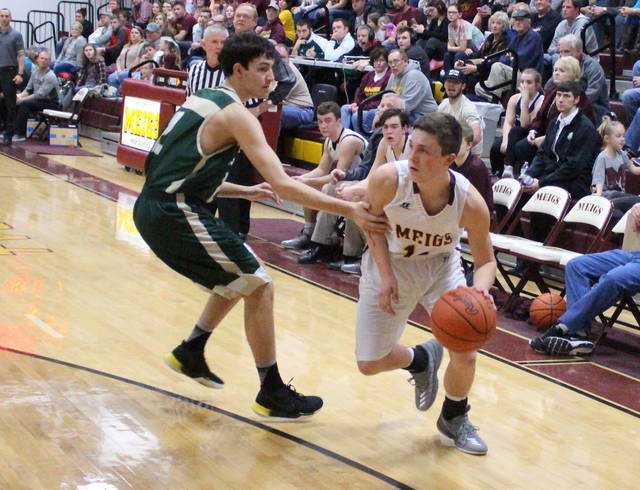 Meigs traveled to Marietta on Saturday and returns to TVC Ohio action Thuesday when it travels to Nelsonville-York for a contest at 7 p.m.